Our family has had a Berkey water filter for years and we absolutely love it. Before that, we had a basic reverse osmosis water filter, and while I loved that it was getting rid of all fluoride in the water, I never loved the taste or that we had to add minerals to the water to avoid nutrient deficiencies since reverse osmosis removes all minerals from water. The Berkey with the added fluoride filters was doing the job really well, but I got many questions from readers wanting an under-counter easier option so I decided to research to see if there were any better options. To be clear, we still love the Berkey and I think it is a great all-around water filter. Fluoride—Many communities receive pretreated, fluoridated water to their homes. Fluoride, known as “The Devils Poison”, has been shown to be less than effective in preventing tooth decay, while possibly contributing to a whole host of health concerns. Related Post: What is the Best Type of Natural Salt? I found many filters that did parts of this but had trouble finding any that did all of it. One day, while shopping at my go-to real-food store online (Radiant Life Catalog) I clicked on their 14-Stage Water Filter just on a whim and started reading. Imagine my surprise (and how dumb I felt) when I found that one of my favorite companies already made a water filter that met all of my specifications and more. I actually got the chance to talk to their main water expert and I quizzed him incessantly about how the filter worked, the percentage of contaminants it removed and filter life, and was even more impressed. Is this a normal Reverse Osmosis system? There are several key things that make the 14-Stage system unique. First, it incorporates three purifiers (reverse osmosis and two deionization purifying stages) to form the foundation of the system, which ensures 99.999% purification when new, only falling to 99.9% over time. Almost all other reverse osmosis-based systems use just one purifier and thus may start at 95% purification, but after a year that figure will often be as low as 80%. This is just one of the things that water dealers won’t tell you. The unique pre- and post-filters offer additional filtration (two of these filters are unique in the industry) and also include a stainless steel and quartz UV light for added protection against bacteria and pathogens. These first seven stages are designed to remove all toxins in your water, no matter if you even know what they are! The reason that we had initially moved away from a Reverse Osmosis filter is that while it removed almost all contaminants, it also removed many minerals and there was some evidence that drinking demineralized water could actually cause problems for the body long term. The RL system removed this problem as well by adding minerals back into the water in the proportions that the body needed and even going so far as to add post-filtering infrared programming to essentially make the water “alive” again. Radiant Life is the only place I’ve ever found that offered this comprehensive of a water filter. We recently installed their 14-stage filter under our kitchen sink, and I’ve loved the convenience of it. Again, I still think the Berkey is a great option, but I wanted to test an under-the-counter option for readers who had asked and I couldn’t be more pleased. It took about an hour to install and now we have clean water on-demand from a spigot at our sink. My only complaint with the Berkey was the constant hassle of refilling, and our 14-stage filter removes that hassle. The new filter was a big jump for us and something that we saved for and considered for a long time. We actually also got the whole-house filter for shower water since I am so sensitive to fluoride and chlorine in shower water with my thyroid condition and I’ll be sharing about our experience with this soon. Unfortunately, good water filters are an up-front investment but the daily cost is $0.30-$0.40 a day, which is definitely manageable over time. The RL filter also has a built-in water testing kit so that you only replace the filters when needed, saving additional time and money. Like I said, Berkey is a cheaper option and I think it is still a great filter, but if you are looking for the next step up or want an under-counter option that won’t take up counter space, the 14-stage filter is my new go-to favorite by far! I love that Radiant Life is a family owned-company and I’ve had the chance to visit with the family who owns it at several conferences. The Radiant Life family cares so deeply about real food and natural living, and they are all very knowledgeable about water, air and food quality. They are also just genuinely good people who care about the future of our children, and the environment. Though the 14-stage filter wasn’t inexpensive, I feel like it is a great deal for what it does and I love that we supported a family-owned US based company. If you’re still trying to decide what the best water filter is for your family, they offer consultations with their team of water experts and can help guide you to the best option for your family. 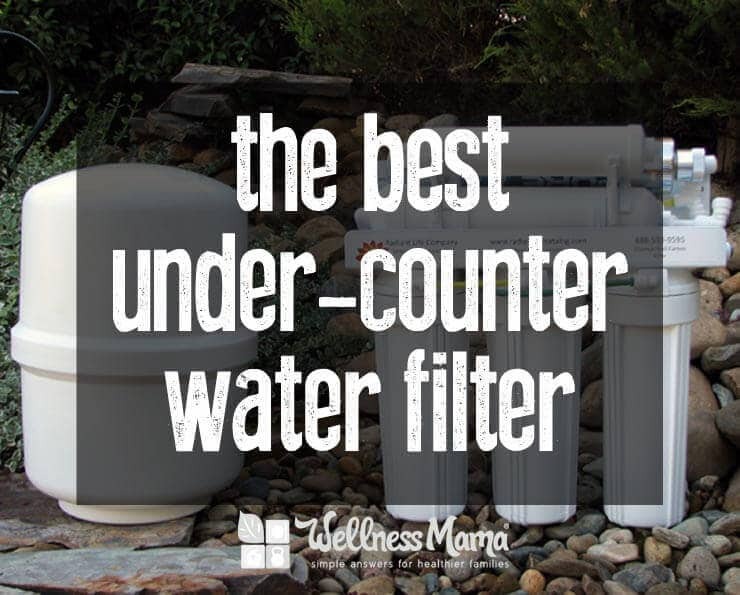 I’d love to know…what water filter do you use? What do you want in a water filter?